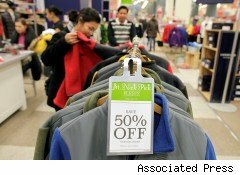 Consumer confidence unexpectedly fell to 52.5 in December from a revised 54.3 in November, as a sluggish U.S. job market prevented consumers from changing their cautious stance toward the economic recovery. A Bloomberg survey had expected the index to rise to 57.4 in December. The index was at 50.2 in October, 58.6 in September, and 53.5 in August. It hit a record low of 25.3 in April 2009. Lynn Franco, director of the Conference Board's Consumer Research Center, said although consumer confidence unexpectedly dipped in December, the longer-term trend offers a more encouraging picture. "Despite this month's modest decline, consumer confidence is no worse off today than it was a year ago. Consumers' assessment of the current state of the economy and labor market remains tepid, and their outlook remains cautious," Franco said, in a statement. "Thus, all signs continue to suggest that the economic expansion will continue well into 2011, but that the pace of growth will remain moderate." Most components of the index dipped in December, with a slightly better outlook toward business conditions but more -guarded about the job market. Regarding the economy's six-month forecast, those expecting an improvement in business conditions increased to 16.6% in December from 16.4% in November, while those expecting business conditions to worsen decreased to 12.1% from 12.4%. On current conditions, those claiming they're "good" edged lower to 7.5% in December from 8.5% in November, while those saying conditions are "bad" decreased to 41.2% from 42.9%. Regarding future job prospects, those anticipating fewer jobs in the months ahead increased to 19.5% from 19.1% in November, while those anticipating more jobs fell to 14.3% from 15.1%. Also, those saying jobs are "plentiful" decreased to 3.9% from 4.3% in November, while those saying jobs are "hard to get" edged up to 46.8% from 46.3%. In addition, consumers expecting an income increase fell to 9.9% in December from 11.1% in November. December's dip in confidence shows both the deep impact of the recent recession and the relationship of job creation to consumer attitudes. Most Americans know someone who's been affected by a lost job during the downturn, or perhaps they've lost a position themselves. At the same time, these consumers also sense that the economy is growing, and that many companies are doing better today than a year ago. However, until these consumers see sustained progress on the job front -- such as a steady drop in the U.S. unemployment rate -- they're likely to maintain a cautious stance toward the economy, particularly regarding their own big-ticket purchases.